To accompany the changes in the tax laws from 1 October 2015, the IRD has now introduced new IRD number application forms for non-resident/offshore non-individuals (IR744) and non-resident/offshore individuals (IR742). An IRD number cannot be applied for until the individual has a fully functional New Zealand bank account in their own name i.e. the account must have the ability to make deposits and withdrawals. The bank account number and proof of its functionality status must be provided to the IRD. The individual’s country of tax residency and their TIN (tax identification number) for that country, together with confirmation of the TIN, has to be supplied to the IRD e.g. a copy of a tax statement or a letter from the country’s tax authority showing the TIN. 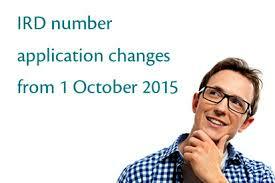 The individual now has to supply their reason for applying for a New Zealand IRD Number with proof to back it up. There is a separate question asked in the “reason” section about the purchase of property in New Zealand and suitable proof regarding this issue has to be supplied. An IRD number cannot be applied for until the entity has a fully functional New Zealand bank account in its own name i.e. the account must have the ability to make deposits and withdrawals. The bank account number and proof of its functionality status must be provided to the IRD. The entity’s country of tax residency and its TIN (tax identification number) for that country, together with confirmation of the TIN, has to be supplied to the IRD e.g. a copy of a tax statement or a letter from the country’s tax authority showing the TIN. If the entity is a Partnership, Joint Venture or Look-Through Company, all Partners/Owners of the entity must now also have their own New Zealand IRD number. As a condition of obtaining a non-resident individual IRD number, the individuals must first set up New Zealand bank accounts in their own names. There is a separate question asked about the purchase by the entity of real estate in New Zealand. Read more or contact Alliotts in Auckland on +64 9 520 9200 to get your information together correctly to meet the 1 October deadline.